As our initial “latest news” articles were getting too long, and as this event will certainly continue to add more news, we have decided to a number of “latest news” articles. Besides the most important earthquake data, also breaking news will be posted here. Reading all of them will be experienced as a movie from minutes after the earthquake until the latest news facts. This update page will put breaking news on the Indonesia Mentawai Islands earthquake whenever it becomes available. The most recent news will be on top of this page. Earthquake-Report.com has been continuously publishing breaking news on this Earthquake / Tsunami starting minutes after the earthquake occurred. Despite the fact that relief aid items had reached lots of tsunami survivors in Mentawai district, West Sumatra, they could not escape from post-disaster diseases. Some tsunami survivors in Bulasak hamlet, Bulasak village, Pagai Selatan sub-district, for instance, are now suffering from sicknesses like coughing, fever, and measles, a health worker said. The House of Representatives has approved the central government`s request for 16.8 lillion US$ (150 billion Rs) extra funds for the natural disaster emergency responses. Those of you are are eager to look into the technical details of this destroying earthquake, will certainly love this map. The map gives details about the height of the waves, the aftershocks, the depth of the sea etc. A moderate aftershock of Magnitude 4.5 shook at 22:01 PM local timer the Mentawai islands . There is however NO risk on another tsunami with these moderate aftershocks. Although exceptions exist, it is commonly known that at least Magnitude 6.5 shocks should occur to generate a Tsunami. Huge underwater avalanches on subductions slopes can also create local tsunamis. These avalanches generating tsunami are however very very rare. The Indonesian House of Representatives has approved the government`s request for extra funds for the natural disaster emergency responses. Remaining funds until the end of the year were too limited to ensure a smooth big intervention if it should become necessary. The Indonesian Red Cross has distributed aid to tsunami victims in remote villages in Mentawai Island. Food supplies and medicines were flown to Mentawai by four helicopters. Earthquake-Report.com remark : It took days before helicopters have been used to reach remote places. This will be a major lesson to learn from this disaster. ALL not urgently needed helicopters should be used IMMEDIATELY to help survivors in such tragedies. It took too long before rescue teams did reach the islands. We have problems to believe the ‘high waves and bad weather’ theory as the distance from the mainland to the islands is no more than 100 km, a small distance for an army helicopter. It took only until after the visit of the Indonesian President, that the rescue operation started to run smoothly. 200 people feared dead in Indonesia’s tsunami disaster zone were found alive Saturday as rescue workers began to reach remote island communities five days after the killer wave. This report was earlier published in Earthquake-Report.com but afterwards removed as we could net get a confirmation about this important news. We are happy that we can republish this fantastic news. Storms and heavy seas have plagued efforts to reach disaster-struck Mentawai villages. Aid organizations said the weather had cleared early Sunday and more helicopters were on the way to ferry aid to isolated communities accessible only by sea or air. Indonesian President decides to move villages of tsunami victims. The Indonesian President has decided to immediately relocate victims of a recent earthquake-triggered tsunami as well as residents living near Mentawai beaches of West Sumatra. A regulation will be issued soon.The government is preparing the construction of about 4,000 shelter houses in highland area that closes to hills. Earthquake Report.com is very enthusiastic about this regulation. The relocation is a wise decision as it does keep intact the way of living of the people, but gives them immediate evacuation possibilities in case of a tsunami alarm. Images and eyewitness accounts of the disaster have slowly begun trickling out as media crews reach the archipelago and tourists are repatriated. The video was shot by Sebastian Carvallo, a tourist staying at the Macaronis surf resort, which was almost completely destroyed by the tsunami. It shows how the 20 staff and 17 guests on location when the wave hit were able to escape by running to the top floor of the resort’s main building. Earthquake-Report.com has been continuously publishing breaking news on this Earthquake / Tsunami starting minutes after the earthquake occurred. Read the Latest News 1 article by clicking here. Comment from Earthquake-Report.com : Earthquake-Report.com was from the very beginning very critical in the slow reaction of Indonesian Rescue and Relief efforts. As we followed the news almost from minute to minute after the main earthquake, it was very clear to us that the devastation and the height of the waves was much greater than initially calculated by theoretical models. It took another 2 days before ships with Rescue and Relief personnel were on their way to the Mentawai Islands. The Indonesian President did come to the same conclusion and ordered an immediate reorganization of emergency services in order to respond quicker to calamities. The JakartaGlobe published an article with the opinion of the President, Government describing also the reorganization and better use of the means of the National Disaster Management Agency. We encourage our readers to read the full article. In the wake of criticism over relief efforts following last week’s natural disasters, President Susilo Bambang Yudhoyono said on Monday that the National Disaster Management Agency would be provided with the necessary equipment to do its job. He said the head of the agency, known as BNPB, held ministerial rank and therefore could sidestep the bureaucracy. This meant the BNPB did not have to waste time coordinating with other ministries. Yudhoyono said he wanted extra funding for the agency in the 2011 budget to ensure its effective operation. “The BNPB should have a high level of readiness, not only concerning its personnel but also its communication equipment and air transport,” he said. The BNPB has 10 helicopters, two Hercules planes, five warships, two ships, six speedboats and 15 longboats at its disposal. He praised the military for quickly mobilizing its Hercules planes to deliver supplies in Mentawai, where access was difficult. The president said people in disaster-prone areas should be trained in what to do when a tragedy struck. “There should be new policies that will really be able to reduce the number of victims when natural disasters hit,” he said. In the case of Mentawai, the president said it was dangerous to allow people to return to villages too close to the sea. “We need a new regulation or a law if necessary to reorganize this for their own safety,” Yudhoyono said. The map, created by Globesec, the Unit for Global Security and Crisis Management of Joint Research Centre of the European Commission, has it all. It gives details about the height of the waves, the aftershocks, the depth of the sea etc. Click on the map or here to look into all the details. Five days after a devastating Tsunami swept across the Indonesian archipelago of Mentawai a video shot by an Australian tourist who narrowly escaped the deadly wave has emerged on the Web. 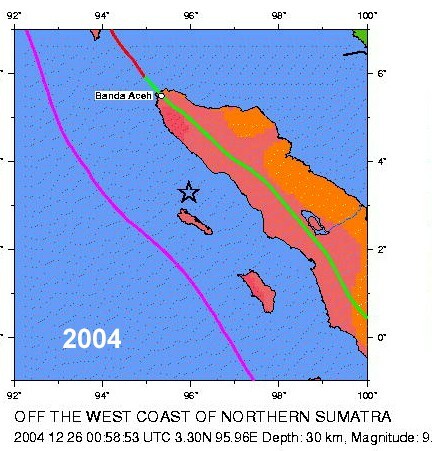 The 3-meter high wave was triggered by a 7.7 magnitude earthquake off the western coast of the island of Sumatra on the night of October 26. The latest official death toll stands at 408, but disaster response officials believe it could top 600 as hope of finding the 303 people still missing fades. Almost 13,000 people have lost their homes and are living in makeshift camps on the island. The Mentawais, a legendary destination for surfers, are an otherwise neglected and hard to reach part of Indonesia. In the immediate aftermath of the quake, damaged phone lines and a poor Internet connection made it almost impossible to reach survivors from the mainland or overseas. Bad weather has hampered efforts to ferry aid such as tents, medicine, food and water to the islands by boat from the nearest port of Padang, which is more than half a day away, even in the best conditions. 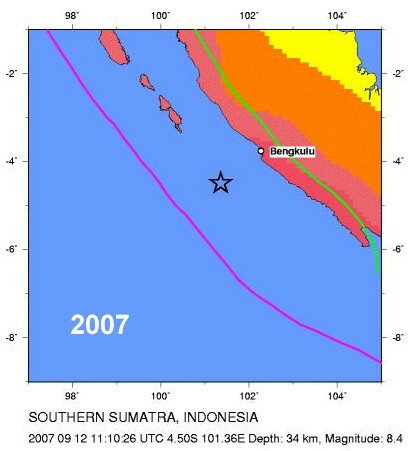 The Pulau Pagai Selatan, Sumatra earthquake of October 25, 2010 occurred as a result of thrust faulting on or near the subduction interface plate boundary between the Australia and Sunda plates. At the location of this earthquake, the Australia Plate move north-northeast with respect to the Sunda plate at a velocity of approximately 57-69 mm/yr. On the basis of the currently available fault mechanism information and earthquake depth it is likely that this earthquake occurred along the plate interface. 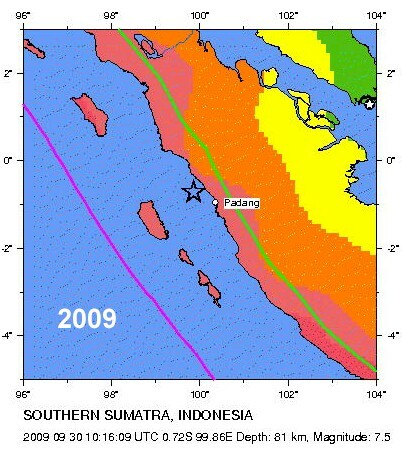 The subduction zone adjacent to the region of this event last slipped during the Mw 8.5 and 7.9 earthquakes of September 2007, and today’s event appears to have occurred near the rupture zones of those earthquakes. 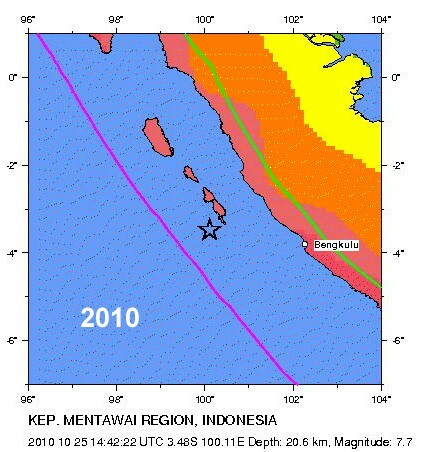 – a M 7.5 300 km to the north near Padang in 2009. As our initial “latest news” article was getting too long, and as this event will certainly continue to add more news, we have decided to start another “latest news 3” article. Besides the most important earthquake data, also breaking news will be posted here. Indonesia’s twitter users were once again shocked by another statement from Information and Communication Minister Tifatul Sembiring, who said that adulterous nations unfaithful to God will receive “Godly condemnation”. Tifatul, who represents the Islamic-based Prosperous Justice Party (PKS) in President Susilo Bambang Yudhoyono’s cabinet, said in a statement on one of his tweets Tuesday “if they deny Our verses, then we will curse them for whatever (sins) they commit”. Numerous twitter users condemned Tifatul for his statement, saying it was improper in the midst of two almost simultaneous natural disasters – a tsunami in Mentawai and a volcanic eruption in Central Java . This was not the first time Tifatul’s tweets caused widespread controversy and public derision. A number of foreign people were reported still missing. They are citizens of three countries, namely France, New Zealand and the United States. The Earthquake-Report.com QUAKESOS iPhone application ranked top 3 in Indonesia. We @earthquake-report.com have build this application to facilitate people getting in contact with family and friends to tell them they are safe or need help with one push on a button. His father, Jekonia (33 years) and his mother Pure (30) along with four brothers were killed by the deadly Tsunami. The baby was found by residents in the middle of the road. The baby is now treated at the hospital of Sikakap. The Mentawai – Pagai islands earthquake number of victims will normally be higher than 650, Earthquake-Report.com predicts. The first 24 to 36 hours one could have hoped that people would have fled into the jungle to be safe for other tsunamis, but after 4 days this hope is no more realistic. Those counted as missing will have been swallowed by the sea or would have been ejected into the jungle. When an earthquake hits a big city, people can run to all directions and authorities will need many days to determine who is missing and who is showing up. In this case the situation is completely different. Most of the villages on the Pagai islands are small to very small and people know each other. Earthquake-Report.com concludes that missing people in this case means more victims., which will bring the ranking of this devastating earthquake to position 3, behind Haiti and China. The cruel earthquake in Chile had even less victims than this tsunami tragedy. The European Commission has allocated €1.5 million (US$2 million) in humanitarian assistance to survivors of the tsunami in Mentawai and the volcanic eruption of Mount Merapi in Java, EU Delegation to Indonesia, Julian Wilson said in a statement Thursday. The funds will help around 65,000 people in Mentawai and at least 22,000 people in Yogyakarta or Central Java. The funding will be channelled through the European Commission Humanitarian Aid and Civil Protection department (ECHO). Earthquake report, who followed all actions from the very beginning, supports BMKG in his response to these critics. People living near the Sea and Oceans should immediately evacuate to higher ground when they feel the earthquake happening (like in both Pagai islands). Billions of Indonesian rupiah in emergency funds have been approved and warships have been mobilized in response to the twin disasters Indonesia suffered this week, but rescue workers and victims are reporting distribution difficulties and supply shortages. Whenever you go for a beach holiday in an earthquake country, be always aware of a possible Tsunami risk. 2) if you see an unusual sea level change: sudden sea water retreat or rise. 3) if you hear a rumbling sound of approaching waves. Then you should IMMEDIATELY evacuate to higher ground. A number of foreign people were reported still missing. They are citizens of three countries, namely France, New Zealand and the United States. Roxane Couty, a French citizen, send electronic mail to Indonesia that she had no news from Yannick Couty since the tsunami struck the Mentawai Islands on Monday, October 25. She suspected that Yannick was on the Mentawai islands with his friend, Axele Madelaine. Yannick and Axele, said Roxane, were in the Mentawai Islands since October 14. They spend a 3 week vacation on an island of the Mentawai archipelago. Roxane fears that her brother must have been on the islands when the tsunami struck. A transportation company who links Padang (mainland Sumatra) with Mentawai, received a call from a New Zealand mother, Mrs. Joanie Irissari, that she was searching her son Ryan, who was on a vacation with two friends to the Mentawai since 25 October. Mrs. Irissari had a last contact with her son on Oct. 25. At that time, Ryan said that he was going from Sibolga to Mentawai. “But after that no news,” said Aim. 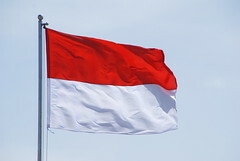 The latest report came from the United States Embassy in Indonesia. The Embassy reported that an American citizen named Arick Salvador allegedly disappeared after departing from Java to the Mentawai on 14 October. Earthquake-Report.com hope that they will be safe and well.